At 6:30 a.m., the lifeless, gray skies only seemed to add to the feeling that Christchurch was a ghost town. After strolling through the lovely Botanic Gardens, where we saw two other people, we wandered into the city center to find a coffeeshop. After living in Melbourne for the past nine months, we just assumed we would find something open by 7. Maybe 7:30 a.m.
Christchurch, with a population of 366,000, appeared not to be inhabited until almost 8 a.m. We wandered down main streets lined with silent construction cranes and stone rubble and past vast empty gravel lots where buildings once stood in the city center. We could have been standing in a post-war zone. We stopped by the historic ChristChurchCathedral, a Gothic Anglican church built between 1864 and 1904, which stands in crumbling ruins behind construction fencing in Cathedral Square. The deadly February 2011 earthquake destroyed the 63 meter-high spire, and subsequent earthquakes in June and December 2011 damaged the church’s stained-glass rose window. I felt downright miserable that this beautiful church has been left in ruins for 5 WHOLE YEARS while the church, locals and city government argue about what should be done about it. Finally, it looks like the parties (maybe) have agreed to repairs and reconstruction to be completed by 2022 if the building is reinstated by the diocese. The 2011 earthquake killed 185 people, injured thousands, caused widespread destruction and was felt across the South Island and parts of the North Island. Our taxi driver from the airport told us he had just dropped off a customer and watched a building fall down and the road ripple right in front of him five years ago. Following the earthquake, a temporary church was built, called the “Cardboard Cathedral,” due to the cardboard tubes used in the building’s ceiling. The Anglican church is still holding worship services and concerts here. Although the city center still looks like a gigantic construction zone, Christchurch is rebuilding – slowly by slowly. We found several things to enjoy during the 24 hours we had to spend here. 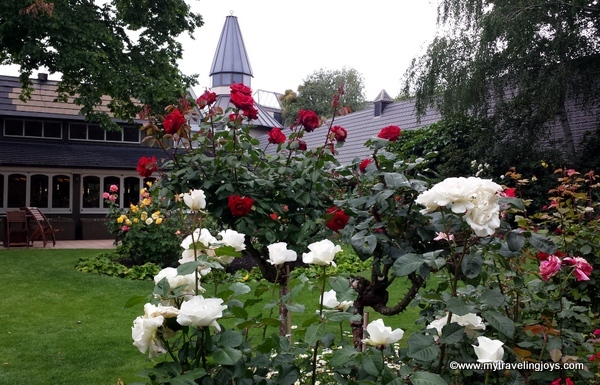 The gardens are located just west of the city center and cover a large area in Hagley Park. 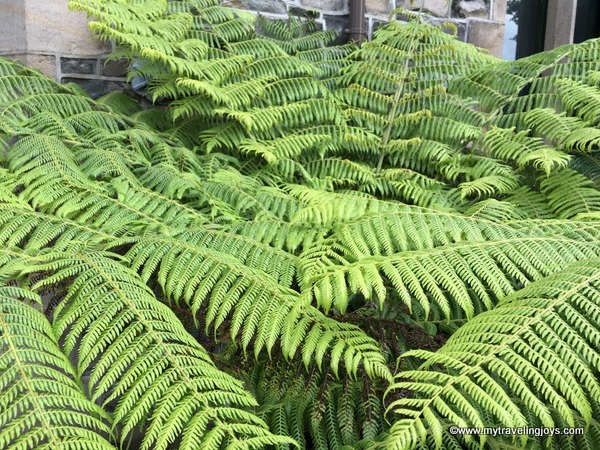 We strolled through the beautiful rose gardens and enjoyed seeing the New Zealand silver ferns up-close for the first time. As we wandered around, we discovered the city’s artistic community has jazzed up the concrete landscape with streetart in the CBD (in a previous blog post) as well as popup stores and art installations. We found a funky shopping plaza called Re:START City Mall that has been built out of shipping containers and features cafés, locally made goods, clothing and food trucks. This is where we finally found a fun, lively vibe! I bought an Andy Warhol-inspired sheep apron and couple of NZ Christmas ornaments. 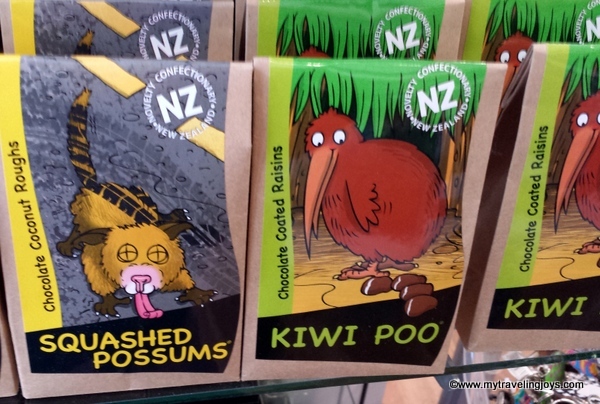 Kiwis have such a good sense of humour. Tree Housesfor Swamp Dwellers, consisting of 10 modular objects identified both as trees and houses, was created by local artist Julia Morison. Located nearby is a solar-powered table that acts as a power station to charge your electronics such as your mobile phone or Ipod. Chairs, corner of Cashel and Madras streets, serves as a memorial for the 185 people killed by the earthquake in February 2011. In December, the Christchurch Art Gallery, home to the country’s largest public art collection, reopened its doors to the public for the first time in nearly five years. 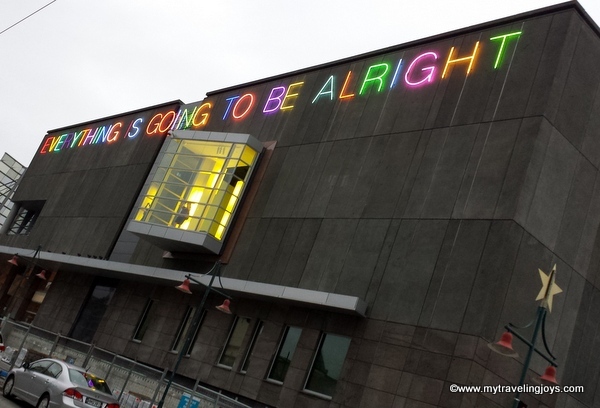 I think the gallery’s outdoor neon sign describes the city’s motto well: Everything’s Going to Be Alright. If you want to pretend you’re in a live version of Candyland, head on over to the charming New Regent Street, a historic shopping street originally built in 1932. This Spanish Mission-style designed street, known then as New Zealand’s most beautiful street, was built during the Depression years to help boost local shopping. We found several restaurants, bars, a bakery that sold amazing cookies and shops selling locally-made tourist goods. 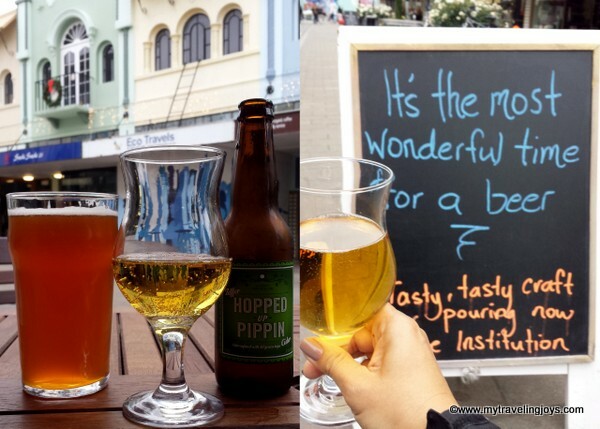 We settled in for a thirst-quenching NZ beer at the speakeasy-looking Institution. 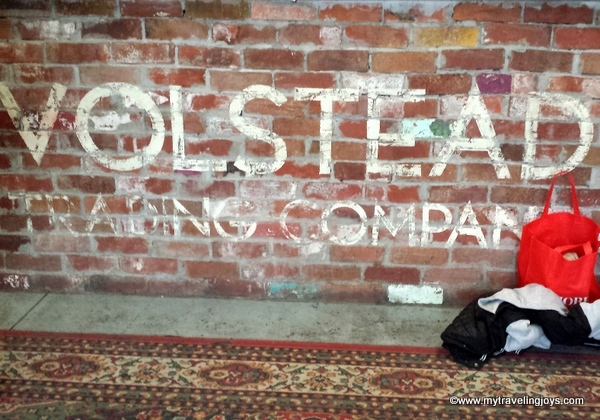 Near our hotel in the Riccarton neighborhood, we had read about a place called the Volstead Trading Company. (in 1919, the U.S. enacted the Volstead Act to establish Prohibition.) Since we loved watching the American series Boardwalk, which takes place during the Prohibition era, we thought this would be an appropriate place to grab an afternoon beverage. This bar featured local craft beers, comfy chairs and a laidback environment – a perfect place to rest our weary feet. 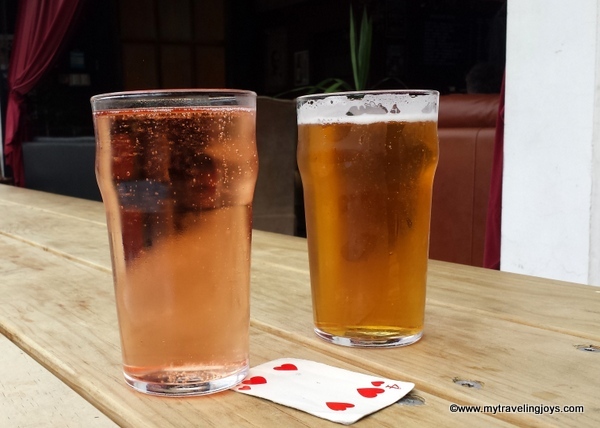 I loved my pink cider beer made from Red Gala apples! Unsure of where to pop in for dinner, we checked our reliable Foursquare app to see what looked good nearby. That’s how we ended up at the popular Fiddlesticks Restaurant and Bar. 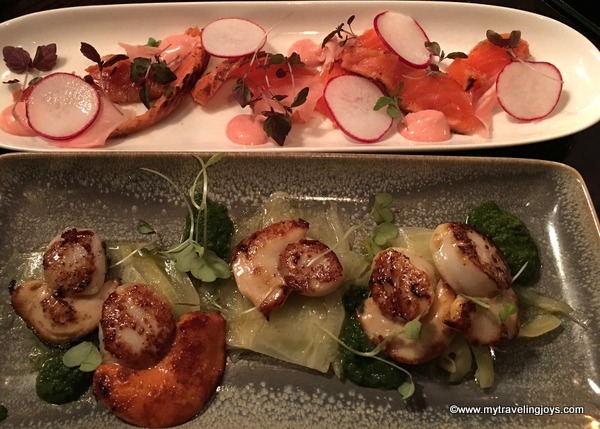 Well two of the dishes I have photos of are the seared scallops and locally-cured NZ salmon with pickled ginger – both were delicious! The restaurant also had a nice selection of NZ wines by the glass. Today, as the residents of Christchurch remember the five-year anniversary of the 2011 earthquakes and those who died, let’s not forget to support this city. I believe the city, like the Phoenix, will continue to rise from the ashes and soar again! 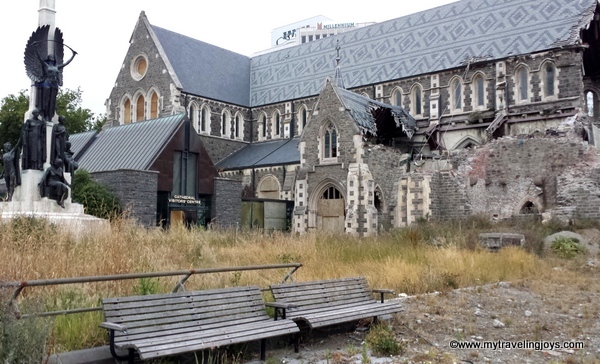 If you are traveling to New Zealand, be sure to spend some time in Christchurch and help this friendly community rebuild. 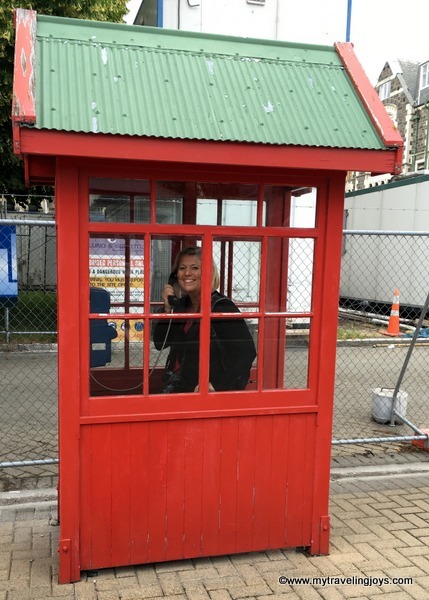 Playing in an old-fashioned telephone booth in Christchuch. The rose garden in the lovely Chateau on the Park, where we stayed for one night. The hotel offered a free shuttle bus ride to the train station, one of the reasons why I chose it; however, for convenience sake I wished I had selected one of the hotels in the city center. We ended up walking more than 10km since it was about 2 km from the hotel to the CBD. Great blog post, Joy. We were in Christchurch airport on 16th February, when they had the latest earthquake! We were fine, but many of the locals were traumatised, having experienced the big one! @Elizabeth, OH wow! That would have been a bit scary. Thank goodness everything turned out okay from that one. what a place! a telephone booth! now that's an OBG! It looks like they have a lot to offer and still some stuff to do before they get back to their old self! Thanks for sharing. 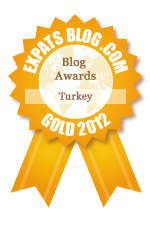 I'm trying to remember if there is a monument in Izmit to the tens of thousands killed in the 1999 Turkish earthquake.